Recent events have shown what kind of havoc waves can cause. We may never calm the seas, but advances in coastal engineering could reduce their damage. When Robert Anthony Dalrymple watches the surf, he sees the approaching swell, the foaming curl, the cascade of water, the sea sliding up the beach toward his feet. He's no less mesmerized than the rest of us. But where most people look at plunging surf and see chaos, he sees structure, eddies and vortices, wave forms and fluid mechanics. "I see things I can predict," he says, "and things I can't predict." He smiles and adds, "I can be very boring at the beach. My wife doesn't enjoy going with me anymore. She makes me go to the mountains now on vacation." Tony Dalrymple is a wave guy. A professor in the Department of Civil Engineering in Johns Hopkins' Whiting School, he works as a coastal engineer, trying to better predict the behavior of the shoreline during short-term events like a hurricane, and over longer durations, like the next century of human development. His contributions to the field resulted in his election last February to the National Academy of Engineering. As a scientist, he analyzes and models waves. As an engineer, he studies the human implications of all that moving water. The seriousness of those implications has become obvious during the first years of the 21st century. Massive hurricanes have pummeled the southeastern United States, and "pummeled" doesn't begin to describe what Katrina did to New Orleans and the Mississippi Gulf Coast last year. The day after Christmas 2004, the seabed of the Indian Ocean heaved and generated a tsunami that killed more than 283,000 people. In the years ahead there likely will be more storms, more floods, more changes to coastlines, more work for Dalrymple and his colleagues around the world. As the planet warms and sea levels rise and storms become more severe, he anticipates no shortage of work. He laughs when called a civil engineering action figure, but he is part of a response team assembled by the American Society of Civil Engineers (ASCE) to fly into disaster areas and assess what happened. He surveyed Thailand after the tsunami, and was in Louisiana after Katrina. By going in four or five weeks after a debacle, the engineers avoid hindering search-and-rescue operations, but arrive in time to gather evidence of what happened, where civil engineering succeeded, and where it failed. Dalrymple's first impression upon entering the city was of desolation. "There were no people. No traffic lights. No lights in the skyscrapers. New Orleans was dead." In New Orleans, the world's attention has been on what failed. As surely everyone who read a newspaper or watched television during Katrina knows, much of the city lies below sea level. You can walk beside some of its canals and find yourself strolling below the waterline of a passing ship. A complicated system of levees and floodwalls protects New Orleanians from floods, but that system was designed to withstand a Category 3 hurricane. When Katrina hit last August, it was a massive Category 4 storm. The city's levees failed with catastrophic results. Floodwaters inundated 75 percent of the New Orleans metropolitan area. Not since the 1906 San Francisco earthquake had a major American city suffered so much damage. Dalrymple got there during the first week in October, five weeks after the storm, delayed by a second hurricane, Rita, that reflooded parts of the city. The ASCE team accompanied a U.S. Army Corps of Engineers team that wore red T-shirts. This proved essential, because the guys in the red shirts were allowed to go anywhere, and Dalrymple and his fellow engineers went right along with them. His first impression upon entering the city, he says, was of desolation. "There were no people. No traffic lights. No lights in the skyscrapers. New Orleans was dead." The teams began working in the western part of the city around the 17th Street Canal and immediately encountered surprises. The engineers' initial assumption, based on media reports, had been that the protective levees had been overtopped; that is, the hurricane had generated a storm surge and waves on Lake Ponchartrain so huge as to flow over the tops of the levees and floodwalls, undermining and toppling the walls. But that's not what the engineers found. Water had not poured over the walls, at least not along 17th Street and the London Avenue canals. In some places, it had reached no higher than 2 to 5 feet below the tops of the floodwalls. But what it had done, with awesome force, was shove parts of the levee laterally as much as 45 feet. "The foundation design was not appropriate for the situation," Dalrymple says. The levee here consisted of an embankment made from organic, peaty soil and clay, topped by a floodwall. The wall, technically an "I-wall," rested atop sheetpile, corrugated sheet metal driven into the embankment to anchor the wall. If the sheetpile had extended all the way through the levee and into the ground, then the force of the water would have been opposed by the wall and the full weight of the levee. But the sheetpile had been driven only part way into the levee, effectively cutting the embankment in half along its length. When the storm-driven water surged against the floodwall, all that held the wall in place was its own weight and part of the outer half of the levee. Exerting tremendous weight and force, the water simply shoved the weakened levee out of the way, toppled the floodwall, and surged into neighborhoods. "That was an engineering failure that should not have happened," Dalrymple says. At the breach of the Industrial Canal, he saw sheetpile that was not only exposed by the water but straightened into a smooth sheet of metal, like a giant folding windowshade yanked straight. "I've never heard of that happening," he says. The teams saw other things that, from an engineering standpoint, should not have happened. On London Avenue, they found evidence of "piping": water seeping, then tunneling through the embankment. This flow had created sand boils, like little volcanoes spewing sand, on the landward side of the levee. Engineers could not tell how long the piping had been going on, which means the boils may have appeared prior to the hurricane. If so, Dalrymple says, they should have alerted New Orleans authorities to the levees' weakening. One section of levee had been built with sand instead of earthen cores, and it simply washed away, flooding St. Bernard Parish and the Ninth Ward. Elsewhere, especially on the city's east side, floodwalls had indeed been overtopped. When water flows over a wall, it drops down the other side and scours out the soil, undermining the structure. Dalrymple saw plenty of scouring, some of which was avoidable. "You put scour protection on the back side of the wall," he says. The protection, he adds, could have been stone rip-rap, or something as simple as a wide sidewalk. Waves fascinate Tony Dalrymple. "On any body of water you find waves, from your coffee cup to the oceans," he says. The tragedy of the levee failures was that had the system held, the city would have suffered only from high winds and some flooding from waves and storm surge overtopping levees. Flooding would have lasted only a few hours during the peak of the storm before the city's pumps drained the water. "New Orleans knew the system was underdesigned," Dalrymple says. "One of the lessons I learned from this is you should always design for failure. Who [in New Orleans] was not thinking about the fact that in a Category 4 [storm], water was going to go over the levees and over the walls?" In the dry language of its official report, the ASCE team noted that some levees failed at "less than their design water height" — the load they were supposed to handle — which "warrants an overall review of the design of the system." The report concludes with an implicit warning: "The next hurricane season will begin in June of 2006." Dalrymple is tall and slender, with the white-blond hair of a Scandinavian. The nails on his left hand are trimmed close, while those on his right extend about an eighth-inch and look carefully maintained. The explanation is propped in a corner of his faculty office: a guitar. An avid player, he was inspired to take up the instrument by a Spanish friend, another coastal engineer. (A plucked guitar string, he notes, generates a standing wave.) He owns a T-shirt that reads A BAD DAY AT THE BEACH IS A GOOD DAY AT THE OFFICE, a little coastal engineering humor. As a kid growing up with a father in the U.S. Air Force, he loved the water and playing on seashores wherever his dad was stationed. He learned to scuba dive and wind surf. By the time he went to college, he wanted to study something that involved the ocean. He entered Dartmouth as an engineering major in 1963, intent on learning to design underwater habitats, like the modular aquatic living quarters envisioned by Jacques Cousteau in the 1960s. But as he progressed through Dartmouth, it occurred to Dalrymple that engineering underwater communities might not be a growth field. In his senior year, he heard about coastal engineering and thought it sounded interesting. He earned a master's degree at the University of Hawaii in 1968, then took a job at the University of Florida as a research engineer studying wave forces. The Florida job allowed time to work on a doctorate, and when his adviser, Robert G. Dean, received funding from oil companies to study what happens when waves encounter offshore oil rigs, Dalrymple got a dissertation out of the deal. Waves fascinate him, he says, because they're everywhere. "On any body of water you find waves, from your coffee cup to the oceans. They can propagate for thousands of miles without much change. They can be less than a centimeter long, or many thousands of miles. They can be 1,700 feet high or imperceptible. And there's the beauty of describing all of that in mathematics." Better government control of coastal and offshore development, to ensure sound practices, such as restricted development in fragile areas, and elevating buildings above predicted storm surges. Restoration and maintenance of wetlands, which form important storm buffers. Louisiana currently loses 25 to 35 square miles of wetlands each year. Estimates place the cost of a 30-year comprehensive wetlands program for Louisiana at $14 billion. The estimated cost over those 30 years of inaction? For infrastructure damage alone, $100 billion. Funding for the education and training of more people to design coastal structures to resist storms and tsunamis. Federal funding for research of coastal natural disasters is low. Improved planning, design, construction, operation, and maintenance of systems to mitigate hurricane damage. The nation's flood-protection infrastructure is in precarious condition. Congress should enact a national levee inspection and safety program. Waves are everywhere. When a leaf falls in a puddle, it generates a wave. Come to an abrupt stop at a red light, and that slosh you hear is a wave in your gas tank. Drink water, then jog — waves in your stomach. There are waves in lakes, waves in rivers and brooks and the trickle from a garden hose, waves in harbors and inlets, even pressure waves in your bloodstream. The bow of a moving boat and the motion of its propeller generate waves. So do ducks. There are waves in your wine glass, waves in your gutters, waves in an inkwell when you dip a fountain pen. Scootch forward in the bathtub and you generate a standing wave called a seiche — more on that later. Plus there are seismic waves that travel through the earth, sound waves, electromagnetic waves, waves generated by wind coursing over a wheat field (they actually have a name — honami). Dalrymple studies only the ones in water, but he reads scientific papers in other fields that deal with waves, such as optics, to glean new insight or a new perspective from which to consider the extraordinary complexity of water in motion. Ask him to tell you something that you don't know about waves and he thinks for a moment, then says, "Waves vibrate the earth." They pound the ocean floor, and that pounding can be picked up by seismographs near the shore. Ask for another, and he talks about how far a wave can travel. "You can stand on a beach in California and see waves that were generated off the coast of Australia." One more? Wind blowing across a closed-in harbor can create standing waves, like a little boy blowing across the neck of a bottle. The boy makes a sound wave, the wind makes a water wave, but the principle is the same. The harbor resonates. Some harbors, like those at Long Beach, California, and Hilo, Hawaii, have problems when these waves make ships bob at the docks during unloading, as if the whole harbor were being rocked. The North Sea oscillates like this on roughly a 36-hour cycle. Storms on the Great Lakes sometimes push water ahead of them, piling it up against one shore. If the wind suddenly drops off, that water will rebound toward the opposite shore. This standing wave — a seiche — can be deadly. In 1954, a 10-foot seiche struck the Illinois shore of Lake Michigan, and drowned eight people in Chicago. To understand and predict these wave behaviors, Dalrymple creates mathematical models. A fluent explainer, he describes the process: "So you have a phenomenon you want to understand. First you need the equations that govern the physics. We're talking about conservation of energy, conservation of mass, conservation of momentum, that sort of thing. Now these equations are usually really complicated, in the sense that we can't solve them by just doing some calculus. But there are mathematical techniques, like scaling, in which you figure out which terms in your equations are important and which are not. For instance, if you're looking at waves in the Gulf of Mexico, you have terms involving pressure, acceleration, and the viscosity of the fluid. If the ocean were made of molasses, viscosity would matter, but for water it's not a big problem. So that term gets tossed out, and the problem becomes simpler. When the levees failed, damage went from high winds and flooding to total devastation. "So now you've got your equations. You then choose a mathematical technique to solve them numerically. There is a whole slew of methods that can be brought to bear. That gives you a numerical approximation, and you crunch that in a computer until the answer comes out — a numerical description of the physical problem you're trying to model. If you've done it correctly, you should get close to what's going on in real life." Does he then take the numbers churned out by the model and compare them to data from the actual phenomenon, to see if they match? Dalrymple grins. "That's a real critical step. Yes, you have to verify that the model is appropriate." If the model works, then it's easy to do what-ifs, like a business planner working a spreadsheet. Change a variable — say, the duration of storm surge from a hurricane — and you can get a useful prediction of how much of your coastline would be eaten away. "The coolest thing, for the scientist in me, is finding something you didn't expect," he says. "That's the thrill of the whole thing. And usually, if you look you'll find something." Mostly, Dalrymple looks for the unexpected on the monitor of a computer running simulations based on his models. But in January 2005, he went into the field to investigate an event for which good models, and therefore useful predictions, are problematic. For centuries, a massive portion of the Earth's crust, the India tectonic plate, had been sliding toward the north-northwest under the Indian Ocean at a rate of about 2.5 inches per year. It was trying to subduct, or dive under, what scientists call the Burma microplate. But tectonic plates are not on bearings and they're not greased. They snag on each other. In this case, the India plate was snagged on and bending the Burma plate, forcing down its leading western edge and tilting up its eastern edge, building immense potential energy. The sea bottom was a huge cocked spring, and starting at 7:59 a.m. local time on December 26, 2004, the spring let go. Seismologists call what happened a mega-thrust event. The first slippage was small, but then there occurred a sudden violent spasm as the India plate slid under the Burma plate, lurching 50 feet toward Indonesia. The front edge of the Burma plate heaved upwards more than 6 feet while its eastern section dropped, releasing even more energy. Along an underwater fault line, the subduction traveled like a giant zipper for 750 miles, the length of California. The mega-thrust event went on for 8 minutes, the most powerful temblor since the 1964 Alaska earthquake. But for hundreds of thousands of people, the event generated a deadlier number: It displaced 200 billion cubic meters of water. A tsunami. Energy let loose by the earthquake sped east and west of the rupture at the speed of a jet airliner. In 30 minutes, massive waves traveled 300 miles and hit Banda Aceh, Indonesia, wiping out 90,000 people. Though the colloquial term for a tsunami is "tidal wave," the actual phenomenon is much more complex (and has nothing to do with tides). Four waves hit parts of Thailand. To the west, the main wave was so long it wrapped around the island of Sri Lanka before striking coastal areas of India. After barreling into Kenya and Somalia, waves bounced back and hit Thailand and Indonesia again. The whole Indian Ocean reverberated. Says Dalrymple, "Waves were just banging back and forth. It was like hitting a bell." 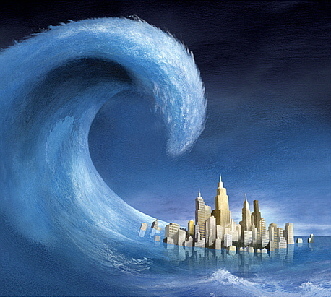 Before its energy was spent, the tsunami propagated into all the world's oceans. The National Geophysical Data Center recorded 302 run-ups — tsunami waves striking coastlines around the world. Wave energy, shunted and steered by underwater ridges, shot between Australia and Antarctica and headed east and north, eventually landing on the Canadian Pacific coast. Westward, waves wrapped around Africa, then split, with energy headed for North and South America. Twenty-one hours after the quake, tide monitors near Rio de Janeiro registered a 3-foot offshore swell. Eight hours after that, 1.5 feet of water came ashore at Nova Scotia. Six inches of tsunami lapped at Cornwall, England; 4 inches at Los Angeles; 9 inches at Atlantic City, New Jersey. No tsunami had reached so far since Krakatoa erupted in 1883. In the coastal areas that define the Indian Ocean, at least 283,100 people died — drowned or battered to death by floating debris. 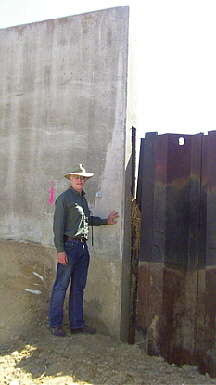 Dalrymple shows a sheetpile wall that failed during Katrina, pointing out the difference in height between it and the concrete flood wall to the left. "Reasonable design says that the walls should all be at the same elevation," he says. A month later, Dalrymple and an ASCE team flew into Phuket, Thailand, one of the wrecked beach resorts, and for five days traveled to various devastated places along the Thai coast. As a coastal engineer, Dalrymple was surprised by how much the beaches had already recovered. Not the people or the houses or the businesses, but the sand. Immediately after the waves, Thailand's western beaches were literally gone, sucked out and washed away. But in a single month the action of the surf had rebuilt them. How did that happen? "Interesting question," Dalrymple says. Sand is resilient, he notes, hard to destroy. In Thailand, he says, the tsunami carried some of the beach landward, but then dragged sand out of river beds as the waves receded. This sand was deposited offshore, then later moved to shore again by the surf. Dalrymple was startled by the speed with which these processes restored Thailand's beaches. As an engineer, he was interested in how structures fared during the inundation, and if any protective measures had worked. Some buildings set on raised pilings survived; the sea surged through the pilings and left the structure intact. Seawalls in areas developed for tourism, like Phuket's Patong Beach, blunted the force of the water. They had been overtopped, for sure, but still mitigated damage to landward structures. At Patong, the engineers observed, the wall had wide openings, every block or so, to provide pedestrian access to the beach. Here, of course, the water simply poured through, scouring the beach around the openings when it retreated. The shape of a wall changed its effectiveness. Concave barriers turned the water back on itself, providing additional protection. At the north end of the beach, the engineers found a wall that had not been so effective. This one, for some reason, had been built with a landward incline. During the tsunami, the water hit the incline and flew into the air as if off a ramp — straight into the second story of a beach house. The first story emerged relatively intact. The ASCE report notes, with just a touch of wryness, "The lesson here is that seawalls should not be sloped landward." Wherever he went, Dalrymple found evidence of how big the waves had been. On his computer in his office, he calls up a photo included in the ASCE report. It shows a van parked under a lone tree on the sand, near water's edge at Khao Lak. An arrow superimposed on the image points to debris snagged by the tree, at least 25 feet above the ground. At Patong Beach, the engineers saw cars stacked atop each other or resting on structures. 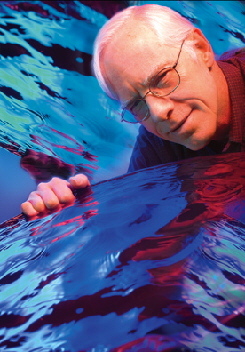 As a modeler, Dalrymple was curious how well computer models of tsunami behavior matched reality. He calls the 2004 disaster the most recorded tsunami in history. Instrument stations all over the world collected data. For the first time, radar from satellites measured the amplitude and progress of the tsunami waves as they propagated. On the eyewitness level, dozens of tourists shot video of water slamming into Thailand and Indonesia. Within 24 hours, a remarkable amount of information about the disaster was available on the Internet, and scientists had an abundance of data. When they matched that data to models of tsunami behavior in deep water, Dalrymple says, the models proved accurate. But simulating a tsunami crashing into land or structures is far more complicated, and here the models, though better than expected, need a lot more refinement to be useful for anticipating structural damage and creating safeguards. Dalrymple is working on modeling the action of waves flowing through buildings — or lifting them from their foundations and carrying them off. The coolest thing is finding something you didn't expect. Cool things keep happening in the study of waves. For example, in 2002 a pair of oceanographers announced that they'd detected a new sort of wave that hugs the sea bottom and exchanges energy between the ocean floor and the water just above it. Another example: For decades sailors have told tales of rogue waves, of 60-, 70-, even 100-foot monsters that rise from a calm sea and overwhelm ships. Scientists long discounted these because they just didn't make sense. Proven models predict few storm waves as high as 50 feet, even in the midst of a severe storm, with one 100-foot monster predicted every 10,000 years. Yet in July 2004, European researchers announced that during a three-week survey, satellites had captured images of 10 massive ocean waves, some nearly 100 feet high. The sailors appear to have been right, and scientists do not have an adequate answer. Keep sources of debris and cars away from the front of structures. Sand dunes, especially vegetated dunes, can lessen the effects of tsunami run-up on inland development. So can properly built seawalls. These walls should be vertical or concave, with few or no low sections such as pedestrian openings. Buildings in the hazard zone should be built on deep foundation piles. Those buildings should be designed to allow water to flow through. Design of structures should take into account the erosive effects of tsunami waves receding. Water returning to the sea undermines structures and foundations. "There are just so many interesting problems," Dalrymple says. The Department of Defense has just granted $5 million to a consortium of scientists, including him, to study what happens when waves come ashore over a muddy sea floor. Mud tends to dissipate wave energy. A better understanding of how that works might allow defense analysts, using satellite images of waves, to determine the composition of sea coasts in parts of the world where an on-site survey would be hazardous, if not impossible. Lately, Dalrymple has been thinking about how waves break, and about surf zone turbulence, neither of which is well understood. People who work on off-shore oil rigs, or have to worry about the next hurricane or the migration of a resort's precious beach, would benefit from better understanding of both. He has a new model that employs smooth particle hydrodynamics. The basic idea is to consider a wave as if it were composed of 100,000 tennis balls, each ball a wave particle programmed to behave according to the laws of physics. On his computer, Dalrymple sets in motion an animation of a breaking wave, with the particles — the tennis balls — represented as a slew of tumbling red dots. As the wave breaks, a portion of the dots forms a sort of jet that bounces off the water's surface. Dalrymple points this out, then adds the puzzler — water doesn't bounce. Point a hose at a wall and yes, the water will splash, but it doesn't bounce back at you. Yet here are a bunch of red dots on his computer screen, bouncing like . . . like tennis balls. And the model is right — he has found the corresponding phenomenon in actual waves. "You make the model, and it predicts what you want," Dalrymple says. "Then all of a sudden something new happens. You can observe that and forget about it, or you can observe that and ask, Why does it do that? And that leads you into a whole new area." Rip currents, those powerful seaward currents that can unexpectedly pull swimmers away from the beach, have long fascinated him, and he's been studying them, too. He says, "During a study in the laboratory, my then-student Merrick Haller and I noticed that the rip currents flowing seaward from the beach were waving back and forth, like a flag in the breeze." Previous, simpler models had predicted that the currents would be steady and fixed in place. Dalrymple and Haller, who is now an assistant professor at Oregon State, rechecked their work. "Rather than being a mistake in the laboratory procedure, we found something cool: Rip currents can be unsteady. By using more sophisticated numerical models, we were able to predict this unexpected behavior." Though he does the bulk of his work in his faculty office and on the university's powerful parallel computers, Dalrymple does occasionally go to the beach and watch the surf. "It's kind of humbling," he says. Does he look at waves and see equations? "Not equations. I see the fact that I can model it." He pauses. "But then I see something really bizarre, like a wave bouncing off the beach and heading back to sea, and it smacks into another wave and there's huge spray and I think, Ooooo . . . I can't model that."